Two trains of empties cross just north of Peak Forest station on a damp and misty November 23rd 1978. From October 1975 to June 1981 25144 was allocated to Kingmoor, so is a little off the beaten track for its normal workings. It appears to have in tow a standard rake of eighteen wagons. The nineteen year seven month career of D5294/25144 was spent allocated to a variety of London Midland depots. Angled strip at bottom of cab doors (April 1979). Time between last Classified repair and withdrawal: 47 months. Time between withdrawal & scrapping: 50 months. October 1964 to Nottingham (16D). March 1972 to Manchester Division (D09). Reinstated June 21st 1981 to Bescot. To unserviceable store April 6th 1983. 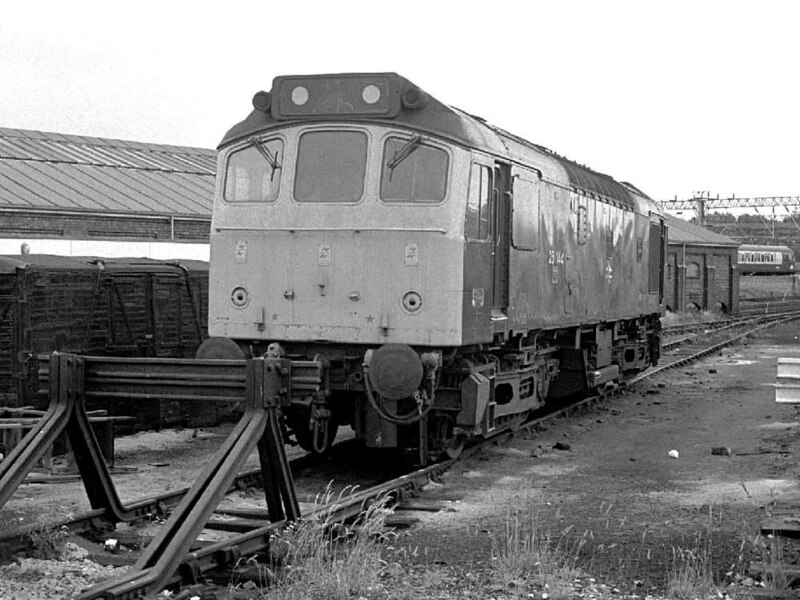 25144 was the 173rd Class 25 withdrawn, one of six retired during April 1983. 25144 sustained accident damage about April 4th 1983 in Watford Yard, precipitating its withdrawal amd movement to Cricklewood. The minor damage was confined to a small area on the 2nd man's side of the No.2 end cab. 25144 was moved to Swindon Transfer Yard (see details below) on July 12th 1984 and into Swindon Works by July 23rd 1984. Swindon Works closed prior to the scrapping of 25144, it was moved to Cocklebury Yard on May 26th 1987 with 25123 & 25133 and on to Hinksey Yard, Oxford on June 2nd 1987, reaching Vic Berry's, Leicester on June 11th 1987. The locomotive was broken up by the end of June 1987, although the cabs lingered at least until early November 1987. 25027/75, 25123/133/144/158, 25228/234, 97202, 40046/63 Cocklebury Yard – Vic Berry, Leicester June 2nd - 11th, 1987, by 20019 & 20197 (Oxford – Leicester). Noted Crewe Works September & October 1967. Noted Derby Works August & September 1977. Noted Glasgow Works March & April 1979 (General repair). 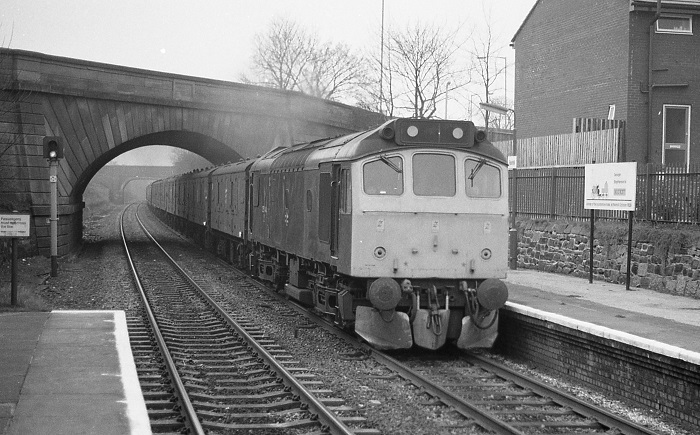 D5294/25144 acquired only a modest passenger mileage total, its first recorded passenger working occurred on July 9th 1965 working the 13.00 Birmingham New Street - Derby, a working for a short time that was covered by hauled stock rather than diesel multiple units. Almost two years later on July 8th 1967 D5294 worked the summer dated Nottingham - Llandudno Town roundtrip with D7572. Reddish Depot held an Open Day on September 9th including Jubilee 5596 Bahamas in steam and giving footplate rides. For the more modern traction enthusiast a vey clean 5294 was also providing cab rides. On August 31st 1974 25144 & 25055 worked the 09.19 Manchester Piccadilly - Yarmouth to Lincoln Central returning with the 09.15 ex-Yarmouth. The 09.29 Manchester Victoria - Llandudno Town was worked by 25144 on June 23rd. 25144 was back in North Wales on August 29th working the 15.32 Manchester Victoria - Bangor and the 19.30 Bangor - Manchester Victoria. 25144 was the Manchester Victoria pilot on New Year's Day. On May 26th 25144 was noted at St Helens Shaw Street with the Springs Branch brakedown train. June 28th 25144 was noted hauling a 'Buzzby Telephone Special' south from Chester through Crewe to ? 25144 was present at the Rainhill Trials 150th anniversary celebration being noted on August 25th 1980 hauling a breakdown crane past the viewing stands. 25144 was stabled at Holbeck on May 17th. Photograph courtesy Tony Sayer. 25144 at Cockshute on July 25th 1981. The locomotive has been recently reinstated and will have another twenty months in service. Possibly the longest passenger turn for 25144 took place on August 9th 1981 when 25094 & 25119 worked a roundtrip Marylebone - Llandudno Town day excursion for a total of 466 miles. Later that month on August 22nd the 07.50 Leeds - Weymouth was worked to Birmingham New Street by 25144, although on the approach to Birmingham New Street the locomotive suffered electrical (traction motor) problems. 25144 was stabled at Bescot on January 30th. 25144 was noted stabled at Nuneaton on the morning of March 2nd, along with 25262 & 25315, whilst two other pairs of Class 25s passed through the station. A scene that would not be repeated for much longer as the infestation of Class 31s into former Class 25 territory continued. Photograph collection of webmaster. 25144 heads east at Rainhill on March 28th 1982 with a lengthy train of parcels/newspaper vans, presumably heading to Red Bank. On June 16th 25144 & 25158 worked a Crewe - Margam coal train. The last recorded passenger workings for 25144 took place during 1982, on June 18th working the 16.05 Leeds - Carlisle (46039 had worked the outward leg), and four days later on June 22nd 1982 worked the 11.55 Glasgow Central - Carlisle. 25144 was noted at Warrington Bank Quay with a local trip freight to Acton Grange on July 29th. 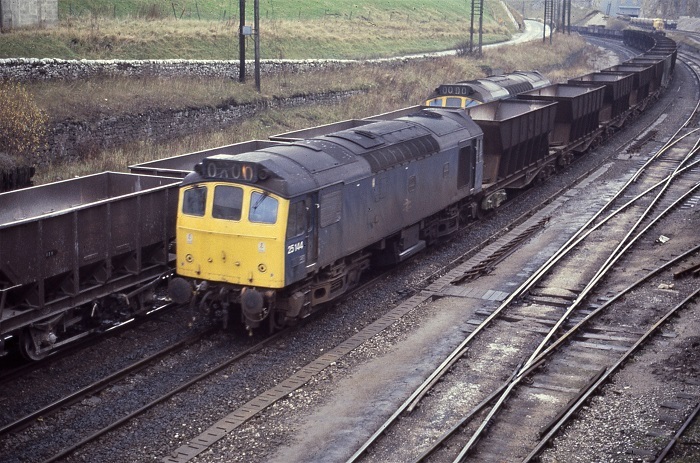 On October 15th 25144 worked the 8L81 12.40 Tyne Yard to Healey Mills freight. 25144 was stabled at Thornaby on November 28th. On December 14th 25144 worked the 15.02 Manchester - Bristol parcels as far as Hereford where it was declared a failure, being replaced by 37233 off a southbound welded rail train. 25144 was stabled at Bescot on Boxing Day. 25144 was withdrawn on April 18th 1983. A cabside number panel escaped scrapping. No.2 cab: 2nd man's cabside: unpainted window frame January 1980 until withdrawn. Both cabs: three electrification flashes August 1979 until withdrawn. No.2 cab: 2nd man's side: cabside valencing heavily dented: July 1982 until withdrawn. No.1 cab: driver's side corner: multiple areas with paint missing: August 1981 - October 1982. Non BIS side: frame level scrape from above battery box to No.1 cab door: August 1980 (painted at some point). Three-piece miniature snowploughs fitted December 1977, January 1978, January 1980, August 1980. Page added June 15th 2013. Last updated August 11th 2018.